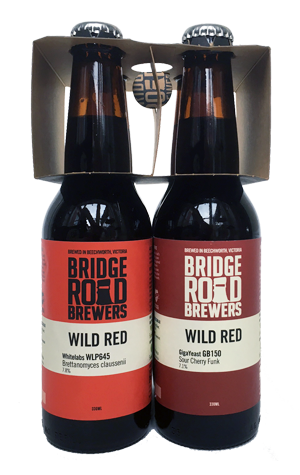 The team at Bridge Road Brewers has long enjoyed putting out collections or series of beers designed to examine what results from the switching of one particular ingredient. It can be fun and educational at the same time. They've done it with hops, yeasts and barrels and, here, they're back doing it with yeasts and fermentation again – and to quite an extensive degree. They started out with a beefed up red ale as the base before splitting it four ways, filling four sets of refurbished barrels with the beer and one of four different commercially available yeasts and blends. Each trio of barrels was then blended back together and the beers released as a mixed four-pack. Working from least boozy upwards, we start with the Gigayeast Sweet Flemish Red (6.5 percent ABV). Like the others, it pours a deep, ruddy red, in this case with a fizzer of a head from which you pick up balsamic like sweet acid aromas, with that sweetness carrying on into its sharp, relatively lean body before it finishes drier than you might expect. Next up the scale (7.1 percent ABV) was our favourite of the foursome, Gigayeast Sour Cherry Funk, which features a blend of Brettanomyces yeast strains and some lactobacillus bacteria. Drier from the off than the Sweet Flemish Red, we picked up tart, acidic cherry fruitiness on the nose. It comes across as the lightest on the palate and the most refreshing too, with red wine like qualities upfront and at the denouement and the best balance of sweetness, fruit, tartness and acidity of the pack. The Brettanomyces Claussenii Whitelabs beer (7.8 percent ABV) would be the one we'd class as the funkiest of the foursome. It has by far the feistiest head and the fullest, creamiest body, one in which we picked up cream soda and cola characters along with the fruitiness from the yeast strain. Last but not least is American Ale, which makes use of the straight-down-the-line Wyeast strain found in most Bridge Road beers. Yet, while the yeast wouldn't have added anything in the way of acidity or funkiness, it appears that time in the barrel has done. So, accompanying the Sherry and sweet toffee characters is plenty of drying oak that adds to the fortified character of the beer, with a welcome acidity balancing the boozy richness. We know that Bridge Road founder Ben Kraus has a different favourite to ours and, really, deciding which you prefer is only a small part of it (especially as he'll probably never brew them again). Working through the quartet is as much about understanding as enjoyment; here's to more of the same from local brewers.